TGIF, Magic City! But now that it's Friday, perhaps you're at a loss for what you're actually going to do with yourself with the next two glorious days of freedom? Not all of us are gonna be "gettin' bottles, bro," this weekend, especially since there are so many unique, non-bottle-service-oriented events going on. 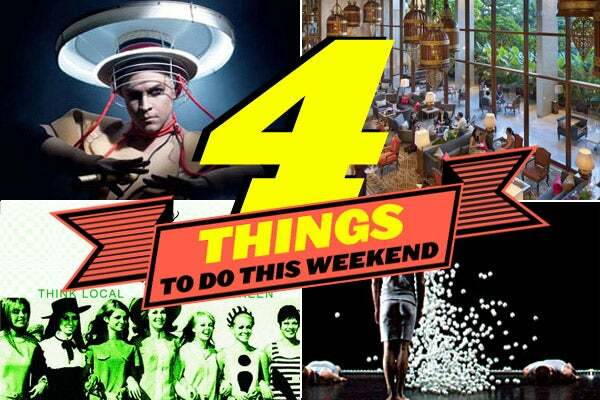 We've rounded up our picks of the city's coolest events, from electro goodness to cutting-edge dance/architecture (yes, you read that correctly). So, motivate yourself off that couch and shake up your routine. Like we said, we got you. These electro-glam gods have been gracing the dancefloors for over a decade and are still just as much fun as they were when they released decade-defining "Emerge." Catch them with fellow Dim Mak stars AutoErotique. Friday, January 29, 11 p.m, $20. At Cameo, 1445 Washington Avenue; 786-235-5800. Dinner and an oceanside dance party? Yes, please. The Mandarin lets those of us who couldn't celebrate the New Year during the week ring in the year of the dragon right, with a buffet, DJ, and open bar. Saturday, January 28, 6 p.m. to 10 p.m., $95 in advance or $110 at the door. At The Mandarin Oriental, 500 Brickell Key Drive; 305-913-8288. Mixing seemingly disconnected forms like architecture and dance makes this show a site-specific wonder to behold. Designer/architect Daniel Arsham teams up with acclaimed choreographer Jonah Bokaer to create dynamic structures. Friday, January 29, 8 p.m., $25. Arsht Center, 1300 Biscayne Boulevard; 305-949-6722. This indie-run, eco-friendly market sets up shop in Wynwood to showcase the wares of local businesses and artists. Great Miami-made goods, folks! Sunday, January 30, 12 p.m. to 7 p.m., free. Wynwood Green, 572 NW 23rd Street, 305-815-2981. Photos: Courtesy of Ticketmaster, Mandarin Oriental, Arsht Center, and Wynwood Green.